Synova, a Swiss-based provider of advanced laser cutting systems, is launching a new CNC machine with full 5-axis capability to process complex three-dimensional geometries. Applications targeted include the machining of industrial diamond employed in toolmaking as well as various composite materials used in aviation. The LCS 305 offers unmatched accuracy, quality and speed with highly dynamic axes, water-cooled linear and torque motors, mineral casting machine bed and fully automatic offset calibration system. The flexible Laser MicroJet (LMJ) system enables 3D cutting and shaping of large and multi-tooth diamond tools resulting in smooth cutting surfaces and sharp edges for ultra-hard materials such as PCD, SCD, natural diamond or tungsten carbide. The machine's two highly dynamic torque motor driven rotary axes also allow chamfering for K-land edges and single or multiple clearance angles. Tools can be exchanged quickly and with a high degree of accuracy thanks to the HSK 63 tool holder. Only the LCS 305 laser system with water jet guided laser technology is capable of precision machining parts made of ceramic-matrix composites (CMC, a composite made of SiC) while protecting the material from heat-related effects. The low weight and heat-resistant new material is used for hot section aero-engine components to increase aircraft efficiency. "The issue of heat affected zones and micro-cracks is greatly alleviated when using Synova's unique Laser MicroJet systems because of the inherent heat dissipation properties of the water jet," says Dr Bernold Richerzhagen, Synova Founder and CEO. 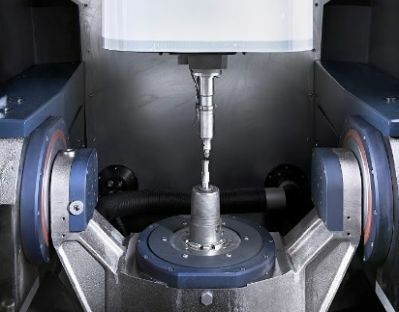 "The LMJ has already been successfully deployed for the drilling of holes and cutting of CMC shrouds and has proven the necessary precision and reliability required for such applications," adds Richerzhagen. The LMJ "wet laser" technology cools workpieces while efficiently washing away debris. The water jet maintains the laser's focus creating a cylindrical laser beam that results in parallel walls and tight kerf widths. 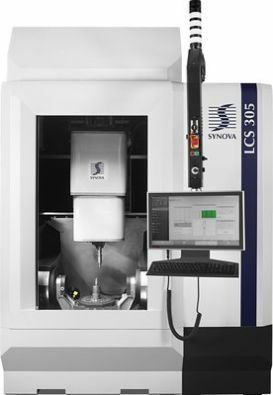 The LCS 305 is a complete computer numerical control (CNC) system that includes the SynovaCut 5.0 CAD/CAM software and SmartFactory functions such as an integrated laser power meter, positioning sensor and automatic jet angle correction. It can be flexibly incorporated into production as either a standalone system or into automated lines for operator-free high-volume production.